During my graduation I became fascinated by our habits of eating alone. Food has never been so easy to access, and yet it has never seemed so difficult to get food on the table. Never in history have we spent so much time alone, been more independent, and yet we’re often paralysed by being alone and will do anything to distract ourselves. Our eating habits in the Western World today threaten the whole world’s climate and often our own health, and yet are being adopted across the globe by those who can afford it. You can read more about this in the essay I wrote, “What is the Problem with Eating Alone?”. 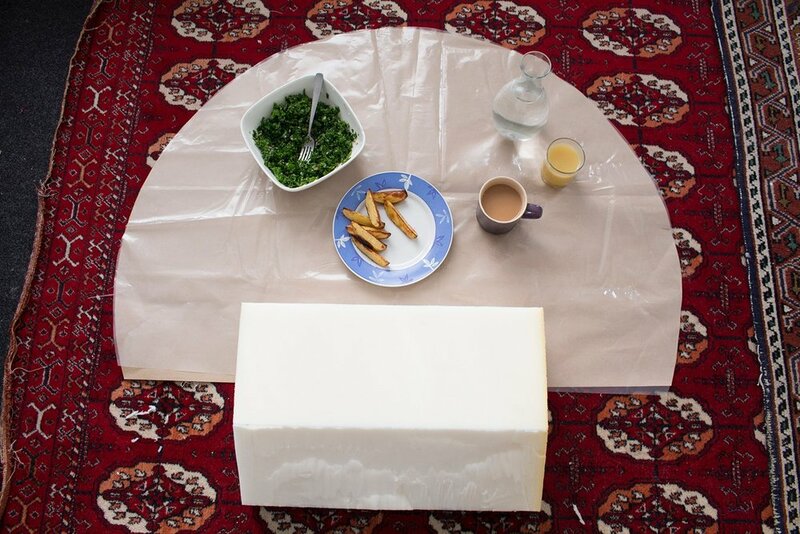 I began this project by eating in different unusual places around the house to break my existing habits of eating alone. It turned a rather unappealing necessity into an adventure. 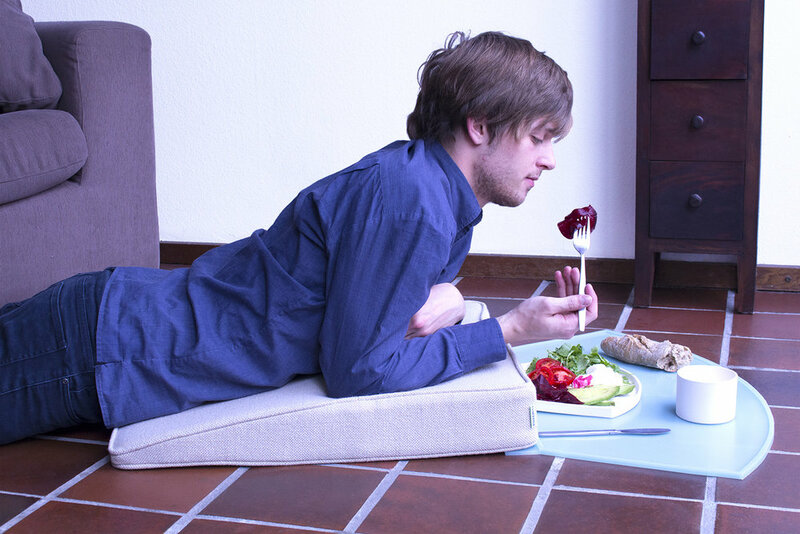 Every line and shape is based on what I needed to make laying on the floor comfortable and hygienic to eat in. These particular shapes came out of the desire to eat comfortably while laying on the floor. Laying on the floor gives you a different view and is an intuitive way to explore your own house. It quickly becomes uncomfortable though, putting a lot of pressure on your elbows. The Incline cushion relieves that pressure and supports your upper body. 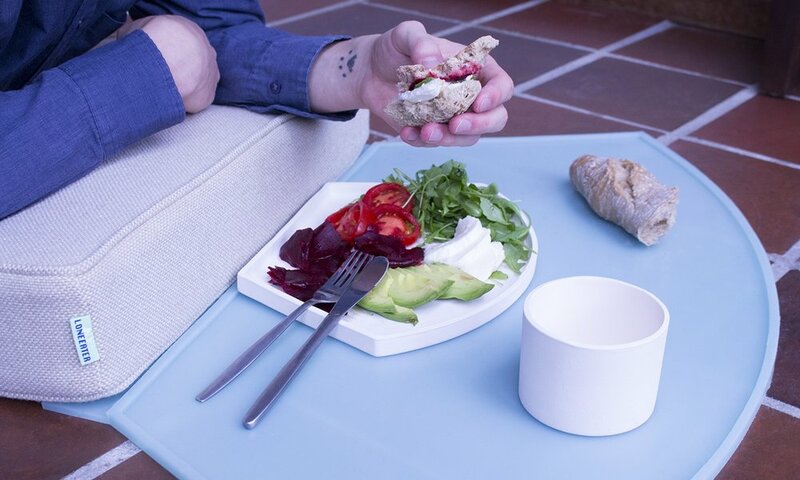 The mat enables eating on the floor to be hygienic, as well as protecting floors from spills. 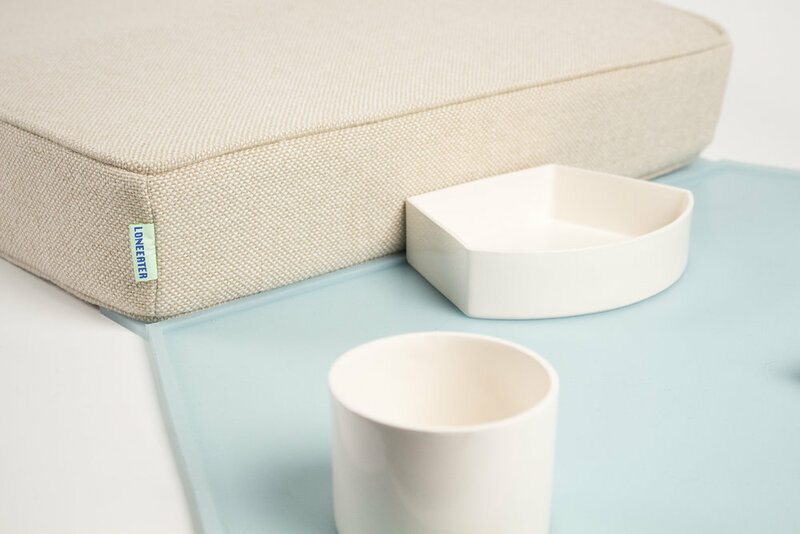 The ceramics here are designed with a flat side, so it can go right up to the edge of the mat and closer to you. I worked with Studio Stelt in Den Bosch to upholster the final design and the fabric was sponsored by Kvadrat giving Incline and Nessle and very luxurious look and feel. Incline with exhibited alongside Nessle at the Design Academy Graduation Show October 2015 where over 30,000 visited. I had the chance to talk with hundreds of interested people who often shared their own touching experiences of eating alone.